On June 2nd, the Consumer Financial Protection Bureau (CFPB) proposed new rules to better regulate payday, title, and other short-term loans. The industry is responsible for predatory practices that trap low-income families into a cycle of debt that costs our most vulnerable communities $8.7 billion each year. 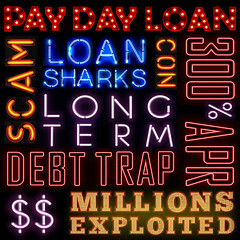 Payday lenders claim they help working families by providing easy access to cash when workers face an economic crisis, but the reality is 75% of the industry’s fees–and profits–come from borrowers who had to take out more than 10 loans in a 12 month period. It’s these unethical, but legal practices that drain $23,951,459 out of the pockets of hard-working people every single day. 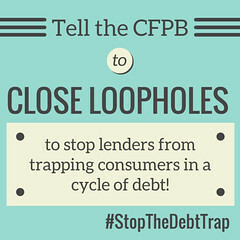 For the first time in history, Congress has given a federal agency the authority to uniformly regulate small-dollar consumer loans including the payday, installment, and related loan industries that strip billions in wealth from our communities and trap our families and neighbors in endless debt. The CFPB is accepting public comment through September 14th and needs to hear from you.